Mihara, S., Hase, E.: 1976: A short note on the effects of 6-methyl purine on the revolution of the cell cycle of Chlorella pyrenoidosa in synchronous culture. : Plant Cell Physiol., 17, 403-406. Naohara, T., Ishikawa, H.: 1975: Assay of the activity of herbicides using Chlorella. : Zassô-Kenkyû, 20, 82-86 (in Japanese with English summary). Takeda, H.: 1988: Classification of Chlorella strains by cell wall sugar composition. : Phytochemistry, 27, 3823-3826. Yoshizako, F., Nishimura, A., Chubachi, M.: 1992: Microbial reduction of cyclohexanone by Chlorella pyrenoidosa Chick. : J. Ferment. Bioeng., 74, 395-397. Yoshizako, F., Nishimura, A., Chubachi, M.: 1994: Identification of algal transformation products from alicyclic ketones. : J. Ferment. Bioeng., 77, 144-147. Yoshizako, F., Nishimura, A., Chubachi, M., Horii, T., Ueno, T.: 1991: Bioconversion of cyclohexaneacetic acid to monohydroxycyclo-hexaneacetic acids by Chlorella pyrenoidosa Chick. : J. Ferment. Bioeng., 72, 343-346. Yoshizako, F., Ogino, M., Nishimura, A., Chubachi, M., Horii, T.: 1995: Biotransformation of cyclic β-keto esters by Chlorella pyrenoidosa Chick. : J. Ferment. Bioeng., 79, 141-145. Maruyama, K.: 1977: Classification of Chlorella strain by infrared absorption spectra of cell samples. : Bot. Mag. Tokyo, 90, 67-77. Hirokawa, T., Takeda, H.: 1980: Automatic analysing system for the liquid chromatography. : J. Gen. Edu. Dept., Niigata Univ., 10, 97-106. 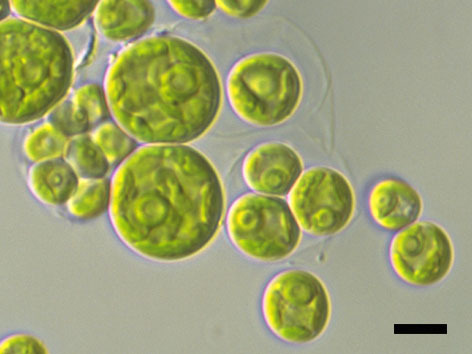 Maruyama, I., Ando, Y., Maeda, T., Hirayama, K.: 1989: Uptake of vitamin B12 by various strains of unicellular algae Chlorella. : Nippon Suisan Gakkaishi, 55, 1785-1790. Maruyama, K.: 1977: Classification of Chlorella strains by cell appearance and group sera. : Bot. Mag. Tokyo, 90, 57-66. Kuramoto, T., Iwamoto, K., Izumi, M., Kirihata, M., Yoshizako, F.: 1999: Asymmetric reduction of ethyl 2-methyl 3-oxobutanoate by Chlorella. : Biosci. Biotechnol. Biochem., 63, 598-601. Hamasaki, A.: 2017: Study of the optimal cultivation for micro-algae. : The 12th Conference on Biomass Science, 27-28 (in Japanese with English summary).